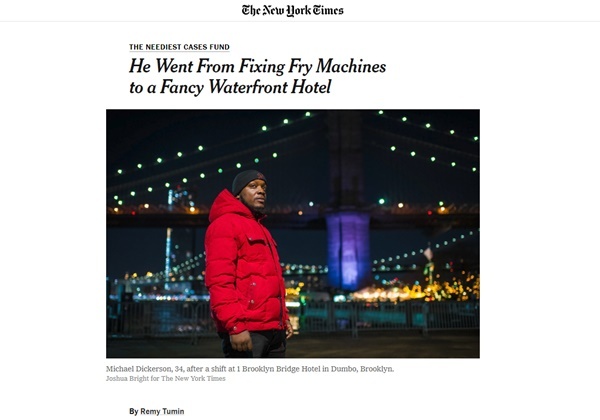 CPC Community Member Michael Dickerson was featured in the January 20, 2019 edition of the New York Times Neediest Cases Fund. The New York Times Neediest Cases Fund provides small grants to agencies, such as FPWA (which CPC is a member of), to provide assistance to NYC's most vulnerable populations. Through FPWA, CPC was able to provide assistance to Mr. Dickerson. Mr. Dickerson attended the CPC Hospitality Careers Training Program. Prior to joining the program he worked at a Queens McDonald's location, stocking the freezer, fixing fry machines, and other odd-end tasks. This was not enough to make ends meet. Once joining the Hospitality Careers Training Program, Mr. Dickerson was able to learn about service areas in the hospitality sector as well as improve on career soft skills such as resume development and communication skills. Taking the skills that he developed in the program Mr. Dickerson was able to secure a job at the 1 Hotel Brooklyn Bridge, assisting with event preparation. His goal is to become a banquet manager and to earn a college degree. CPC is proud of Mr. Dickerson and his accomplishments.